Vault of Light: Leveling a new Priest! One of my WoW related New Years resolutions was to blog more. Considering we're now into the second week of January I'd say I've not been keeping to that particular resolution very well. The holiday are always a busy period for everyone and I hope you all had an excellent time! Now that everyone seems to be back onto a regular schedule it's time to get back down to business. lvl 56. Almost ready to head to Outlands! I recently hit level ninety on my Mage, making her my fourth level ninety. I've been completely neglecting dailys and even gold making in favour of leveling another Priest on a different server. A server I paid to transfer off of a while back. A PvP server! Having gotten a bit bored and restless during Cataclysm myself and a few friends decided to transfer off of our low population, PvE server in favour of faction changing and moving to a high population PvP server. For the first few weeks I enjoyed it but it gradually began to grate on me. As a player I tend to spend very little time within (the safety of) the City walls or in instances instead preferring to level alts via quests or potter around out in Azeroth. I post my auctions and I jet off somewhere. I've never been much of a PvP'er - I get panicky and flustered so being outside with people bigger and with better gear than me was horrifying. I transferred off of the server leaving my friends and what had become my raiding team. Not just due to being ganked multiple times by max level characters I just didn't feel at home there I really didn't enjoy the experience, I'm sure getting one shot by people didn't help the feeling of unease! 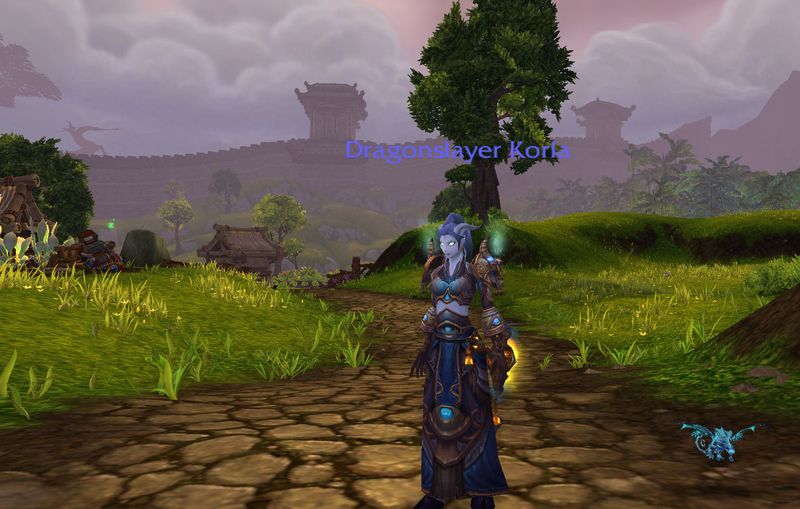 I'm much happier muddling away on my little PvE server on my own but it can get pretty lonesome. I haven't bothered to look for a guild as I'm not entirely sure I want to return to raiding. I do miss it and I miss the comradery but I don't miss the time restraints and those days where you just don't feel like it. I of course have my friends on Real ID but there are still certain things we can't do together. So I've decided to level another Priest. I'm leveling along side my boyfriends Shaman which may be why I've seldom been attacked by people. We did get killed several times by a level 90 in Felwood but I shrugged it off and we continued questing. My plan for this Priest is to PvP. I hate having to constantly respec my main when I want to switch between doing dailys or doing Battlegrounds, heroics or LFR. I've toyed with the Idea of leveling a second Priest for a while as I have multiple max levels of other classes. I had just never felt the need for a second max level Priest. Korla was all I needed <3. However now with the introduction of Challenge modes I'd really like to have a character on my friend's server to join in with those and it'll mean having one Priest primarily dedicated to PvP and perhaps even venture back into Arena. You'll always be my number one Korla. Hey I read but don't comment, bad I know. Unless they've changed it you can do challenge modes cross server. I did one with some friends of mine on another server, well I say 'did' we didn't complete it, as it was start of Mists and we were rubbish. However, surely if it wasn't allowed I wouldn't have been able to zone in? Ahhh I hadn't had a look at it but I believed it was single server only due tot he ranking system. I'll have to have a proper look into it tomorrow! Writers block, where is this going? Kaw Kaw! Get in the Bag! 20 days of blogging 20 days of gold making Achievement addons AH alliance Alt appreciation alts auction house battle pets black market auction house blogging carnival blood elf master race Brawlers guild cat! challenge modes cinder kitten Cloth Mogs collecting collecting. priest contest Death Knight ding Dr Who draenei druid druidweek druid farming Fashion show Fiery Warhorse flipping Fluff For the Horde! friends fun! gear gems Gilneas Tabard Gold gold blogs Gold making grand master pet trainers guild happyhappyjoyjoy Harpies Health horde hunter ihaterogues Introduction legendary quest leveling leveling pets lists Mage mail mogs Main mental health mogit mogolympics monk mounts Paladin Patch pet battles Priest profession cool downs professions PvE PvP questing RaF rage raid mounts Raiding Real ID real life recruit a friend Reputation rogue screen shots Screenshot Sunday Shadowmoon Valley shaman silly stuff soco soul of the aspects spectral tiger Sunsong Ranch tabard talents Tanking The Tillers Transfer Transmog Transmog with tabards Transmogrification trashy Ulduar Warlock Warrior winning WoD beta WoD Hype! world of warcraft wow wow challenge Wow Factor Wow gold wowcrendor yay!